I have to admit, today I am genuinely impressed. When it comes to the Nintendo 3DS (and all the systems in the DS family for that matter) I am very sceptical when it comes to the idea of using the system for anything other than games. Most of the time I feel as if the need for two screens and the touch feature is a little superfluous and unnecessary even for gaming. 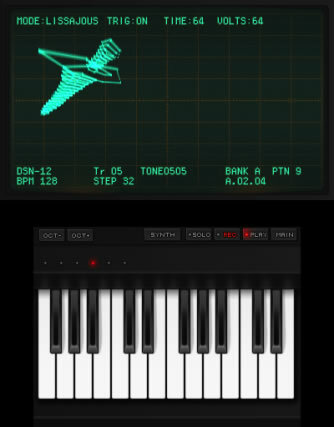 However the 3DS has excelled itself when it comes to ‘KORG DSN-12’. 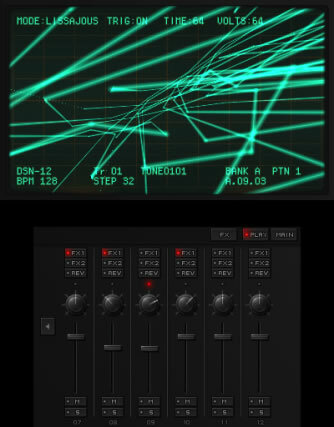 ‘KORG DSN-12’ is the latest piece of music software from the professional Japanese synthesizer outfit ‘Korg’. It is a combination of a synthesizer (electronic keyboard) and a sequencer which is a program designed for users to structure and arrange music tracks. There are much more advanced sequence programs available for PC such as Steinberg’s Cubase, Apple’s Logic Pro or Magix’s Samplitude, however KORG DSN-12 can boast at being both completely portable and just a tiny fraction of the price compared to these top end programs. This software is ideal for both budding amateurs & home studio pros, however before diving in head first I must stress a small note of caution. KORG DSN-12 does a fantastic job of mimicking the interface of a genuine piece of studio hardware (such as an Akai MPC or a Roland MV), however like such devices they operate under the impression that the end user knows their way around studio equipment. The various function keys are usually annotated by abbreviations and beginners are expected to follow a user manual to get to grips with how everything works. Unfortunately since this software is only available for download there is no physical manual. The publishers of this software ‘Detune’ do have a manual available to download on their website, however rather than an organised PDF file this user guide is actually a sequence of scanned BMP files, some of which are quite large and not suitable for printing. Given that this software is available for the 3DS and is extremely affordable compared to similar pieces of PC software it would have been nice to see either a more user friendly interface to assist novices or at least include some onboard instructions / tutorials. However, if you are a novice then please don’t let this put you off as this is a great place to get started when it comes to producing your own tracks. The on board synthesiser is based on Korg’s 1978 model ‘MS-10’ making this software ideal for people with a passion for dance, electronic, disco, trance or techno music, however even if you’re not a fan of these particular styles this software can still be very useful. So here’s how the software works in brief. When you open the program and start a new composition the first thing you encounter is the main board. Here you have can program up to 12 channels and 64 segments. You can program a specific tone to each channel such as the sound of a drum, a clap, a bass note, a lead note etc. The segments are small pieces of your track such as a bar from the chorus, a bar from the verse or a bit of the intro etc. In each segment you can create a tune or melody using any or all of your 12 channels by filling in a grid of notes on the touch screen. However if you find this method of creating your tune to be a little too clinical there is also the option of recording each segment using a mock keyboard interface. You can adjust the speed and (to an extent) the length of each segment individually, however you can set all the segments to a default speed and length in the track’s settings menu. For each segment you create there are plenty of options including being able to adjust the volume of each instrument and even create stereo effects by favouring the left and right speaker outputs. For each channel there is an impressive synthesiser interface allowing you to perfectly adjust and distort the tone you have selected. Adjustments that can be applied to each sound include such properties as overall pitch, peak, cut off, attack, decay, sustain & release. There is also a patch system which allows you to further distort your tones however I have to admit this was a little advanced even for me, but I found by a process of experimenting with it I was able to create warmer, richer sounds for my compositions. Once you’ve finally created all the bars and segments for your piece you now have a couple of options when it comes to sequencing it. This was where I was most impressed. The first option available is the ‘Pattern Program’ method which involves arranging the segments into a timeline style grid in much the same way you arrange the notes in your segments. However, I personally had a lot more fun with the ‘Pattern Pads’ method which allows you to prompt your segments live on via a sequence of pads on the touch screen. This means if you wanted to perform your track you can remix or extend it on the fly (similar to using the software package ‘Ableton’). Although constructing tracks on a 3DS possesses a lot more restrictions than making music on a PC, it is still a great introduction to help enthusiasts get familiar with professional studio software and equipment. Also for a mere £25 it’s a stunningly cheap way to assist creative people with writing music and composing arrangements. If you are a professional and already own some of the more up market software packages this program still offers a quick, powerful and affordable way to compose tunes, rhythms and melodies on the go. Think of it as a producers note pad. There are a few additional little features which are nice but not essential. For example, there is a rather interesting and retro looking visual which reacts to the sound that is playing. There is also a very small number of demo tracks which are fun to play around with, however a wider selection of tracks to showcase a larger range of musical styles would have been appreciated. Overall I can highly recommend this program. 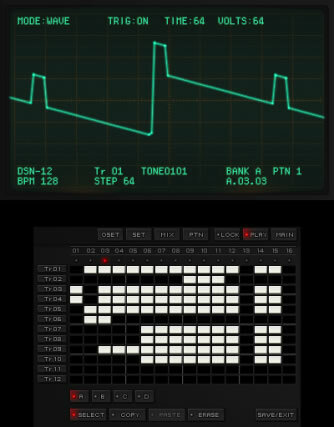 Whether you’re keen on composing your own symphonies or just having a play about, KORG DSN-12 is a welcome addition to the 3DS library. An incredible piece of fan made freeware. Simply brilliant.